Wage growth for China's white collar workers has outpaced the rest of the world in recent years, but costs have also gone up, especially housing prices in "first tier" cities on or near the coastlines. As in many other societies in the world, people in the upper levels of the middle class may feel quite secure in their position in society, while those toward the lower end may feel they are working hard and barely hanging on to their middle class status. In recent days Chinese netizens have been discussing rising costs and financial insecurity in a novel way: they are using the term "cherry freedom," as in one blog post titled "I'm 26 years old, my salary is RMB 10,000 per month but I still haven't achieved 'cherry freedom'" (RMB 10,000 is just under $1,500). "Cherry freedom" refers to the ability to purchase and eat imported sweet cherries whenever one wishes, without having to think too hard about the implications for one's personal finances. Imported cherries are among the most expensive fruits available on the market in China at this time of year. The use of this particular marker of disposable income caught the eye of many in China's fruit industry, who widely reposted articles about the "cherry freedom" meme. The meme has also been trending among the general population in recent days as the country prepares for the annual Spring Festival holiday—a celebration of the lunar New Year for which fruit is a traditional gift, and for which southern hemisphere imported cherries have become the preferred high-end gifting fruit in recent years. Some articles about this topic have received hundreds of thousands of views. Netizens may complain that they like cherries, but feel compelled to eat only a single cherry per sitting due to their cost, but sales nevertheless remain brisk amidst higher than normal prices this season. 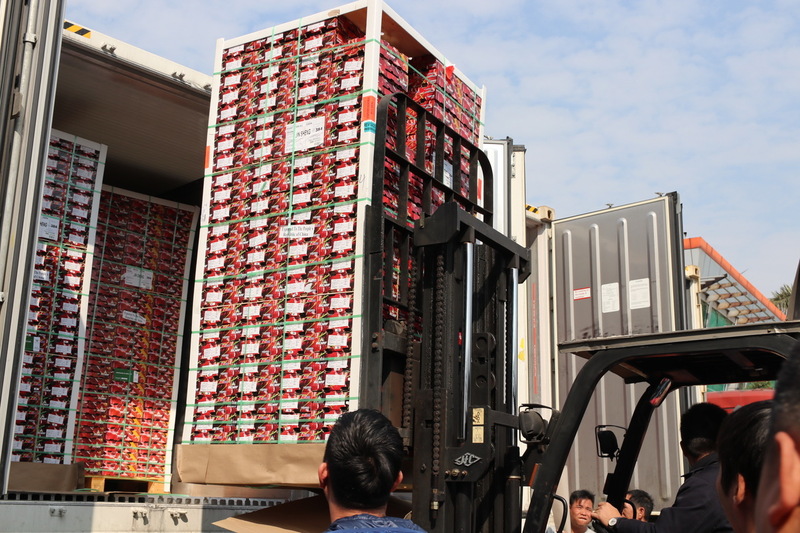 Import volumes hit their peak over the past week or two, with multiple weekly arrivals of up to 400 containers of Chilean cherries at Jiangnan Market in Guangzhou. Jiangnan is the major distribution point for Chilean Cherries coming into China, and Chile is the dominant supplier to China of counter-seasonal cherries. Traders there report that the average price of a 5kg box of cherries is above RMB 100 ($14.86) and around 20% higher compared to at the same time last year. One interesting development that traders have noted this season is that some Chinese companies have begun investing in their own cherry packing facilities in Chile, in order to directly control the upstream supply. The distribution channels for imported cherries in China are also evolving. Imported cherries are the central product for supermarkets, fruit ecommerce sellers and fruit specialist chain shops across China during the pre-holiday fruit purchasing rush. Cherries are key to the holiday advertising promotional campaigns run by outlets such as, Hema Fresh, the "new retail" supermarket from Alibaba Group, which recently proclaimed cherries as a "holiday trump card" on in-store advertisements in Guangzhou. According to industry insiders, the share of China's cherry imports that is bypassing wholesale markets and going directly to these large retailers has risen from roughly 30% last year to about half this year. This increased direct purchasing indicates that cherries are now a mature product in the China market. China Central Television recently filmed a documentary about Chilean cherry exports to China. In some respects, this trend could be construed as good news for wholesale markets: if part of the ever-increasing volume of cherry arrivals bypasses the wholesale markets, it takes pressure off traders to digest a large amount of fruit in a short amount of time. On the other hand, less volume in the wholesale markets can put upward pressure on prices, especially in the leadup to the Spring Festival holiday. Chilean cherry exporters say they are pleased with the broadening of distribution channels because it speeds turnover and can also help spread Chilean cherries further into second and third tier cities in China. Big retailers like the fact that bypassing the wholesale markets can reduce the number of links in the supply chain, let them more directly control quality, and reduce logistics costs. "Cherry freedom" aside, sources in the Chilean cherry industry say that they remain optimistic about the potential of the China market to continue digesting higher volumes of cherry arrivals in coming seasons. And due to the trend of more direct purchasing by retailers, promotional period retail prices for cherries can now sometimes dip below the wholesale prices. More consumers might yet realize their "cherry freedom." The use of this particular marker of disposable income caught the eye of many in China's fruit industry, who widely reposted articles about the "cherry freedom" meme. The meme has also been trending among the general population in recent days as the country prepares for the annual Spring Festival holiday—a celebration of the lunar New Year for which fruit is a traditional gift, and for which southern hemisphere imported cherries have become the preferred high-end gifting fruit in recent years. Some netizens may complain that they like cherries, but feel compelled to eat only a single cherry per sitting due to their cost, but sales nevertheless remain brisk amidst higher than normal prices this season. Import volumes hit their peak over the past week or two, with multiple weekly arrivals of up to 400 containers of Chilean cherries at Jiangnan Market in Guangzhou. Jiangnan is the major distribution point for Chilean Cherries coming into China, and Chile is the dominant supplier to China of counter-seasonal cherries. Traders there report that the average price of a 5kg box of cherries is above RMB 100 ($14.86) and around 20% higher compared to at the same time last year.